Dallas police say a man causing trouble at a Red Bird grocery store pulled a knife on officers who tried to corral him and repeatedly pulled out stun gun prongs. Police said a grocery store manager flagged down two Dallas officers Monday in the 1200 block of W. Camp Wisdom Road because Willie Watts, 47, was riding around a motorized shopping cart, threatening the manager and disrupting customers. Watts began walking down the aisle and pulled an unfolded pocketknife from his pocket and told the officers, “I’m not going nowhere,” according to an arrest warrant affidavit. One officer pulled a Taser, and the other pulled a gun, police said. The officer used the Taser after yelling at Watts to drop his knife. Watts fell, but held on to the knife and tried to stand again. The officer buzzed Watts again. Watts still didn’t drop knife and tried again to stand. The officer used a Taser again, finally causing Watts to drop his knife. The other officer switched from gun to Taser. But then Watts pulled out the prongs and stood up and lunged toward the officers, police said. They Tased him again. Watts pulled out the prongs again and ran through the store and out through the parking lot, police said. Watts made it into a wooded area and began to crawl. The affidavit says officers zapped him again, but he kept on crawling. Another officer tried to use pepper spray to get compliance. Watts took off his shirt and pants and walked into an alleyway. He then jumped a fence into a yard in the 1200 block of Deerwood Drive. Another officer cornered him and used his Taser, finally taking Watts down and allowing officers to cuff him. Watts had two warrants for public intoxication arrests in Dallas. He has also been arrested for resisting arrest in Childress County in the Panhandle. His address is listed as DeSoto. Watts is being charged with aggravated assault against a public servant and evading arrest. 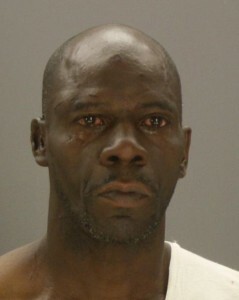 He doesn’t have a bail amount listed in his jail log, but is in Dallas County custody. The Dallas Police Department purchased 2,250 Taser stun guns — supposedly safer to use than the previous generation — last year, and has loosened the Taser policy to allow officers to use them in more situations. Previously, stun gun restrictions had been tighter and the department only had about 700 of them to go around the 3,500-officer department.